If you are looking for professional grade meat slicers and are willing to spend the money for them…check out these Best Meat Slicer Reviews Professional Grade. You can spend tons of money buying presliced meat from the grocery store. You end up going to the market a couple of times a month to buy a pound of meat at a time. Why spend all this money when you can slice your meat in the comfort of your own home. You can buy your meat in bulk and slice it to the thickness of your liking. One of the best things about meat slicers is they slice things other than meat. They are initially intended for meat but you can slice fruit, veggies and just about anything else that will fit on the slicer. If you are unsure of what brand or type of slicer to invest in, these reviews of the top meat slicers will help you make your decision. If you are looking for the best meat slicer you should consider the Chef’s Choice 615 a contender. All of the components that make up the structure of this slicer are created from stainless steel and cast aluminum. This lets the consumers know how durable and well-built the machine really is. One of the main features of this slicer is the diversity of thickness it can slice. The stainless steel blade is 7-inches in diameter and can slice a wide variety of thicknesses. Whether you like your meat ¾-inch thick or thin enough to put on sandwiches, this slicer can get the job done. To ensure the safety of other people in the house, Chef’s Choice has added a button on this slicer. This button secures the food carriage in a lock position to the access to the blade is limited while it is being stored and not used. The slicer as a whole comes apart into many different individual pieces. Each piece is designed to be easily removed for fast and effective cleaning. The Chef’s Choice 615 should be on your list of contenders for the best meat slicer if it isn’t already. Some people aren’t looking to spend a ton of money on a meat slicer. If you are one of these people, this next slicer is perfect for you. 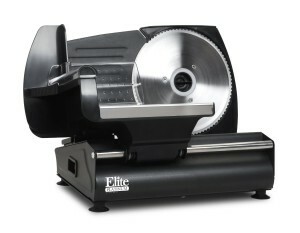 The Continental Professional Series Slicer gives you the best of both worlds. You get the satisfaction of spending less than $100 but the durability of a professional slicer at the same time. This slicer has a bigger blade than some of the other slicers on the market. You will get a 7.5 inch blade with this slicer. The body of this appliance is made of heavy cast iron and is very easy to take apart and clean. Powering this machine is a 150 watt motor to ensure precise slicing every time. There is a plastic piece that helps keep the food pressed against the blade while slicing it. This ensures even slices so you don’t have some large pieces and some small pieces. All in all this slicer is great because it is easy to use and at a very reasonable price. 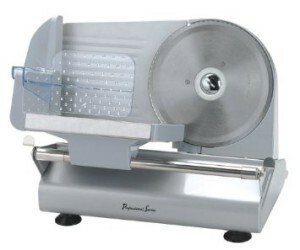 The majority of the meat slicers on the market are only available in a silver color. 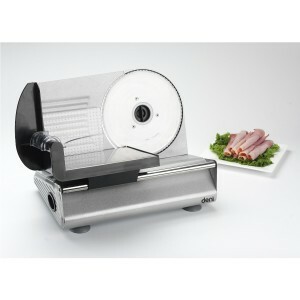 This Maxi-Matic Elite Platinum slicer is considered one of the best meat slicers because it is available in a black color. 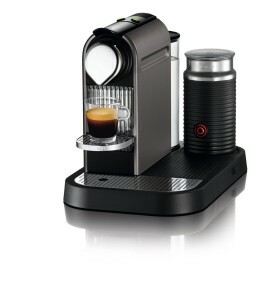 This makes it much easier to match any of your other black appliances you might already have in your kitchen. The housing unit of the appliance is made of a die cast aluminum material. You don’t have to only slice meat with this piece of equipment. You can lice your cheese, meats, breads fruits and even firm vegetables. The blade can be adjusted to give you the thickness you desire up to ½ inch thick. This adjustable blade is great for everything you decide to slice. Your meats can be sliced at a thickness that is perfect for sandwiches and your fruits can be sliced at a thicker dimension for food displays. The slicing platform is very large to ensure you can slice the bulk meat you buy at the store. The great thing about this slicer is it has rubber feet. You don’t have to worry about the appliance sliding all around the countertop while you are using it. The rubber feet will keep the slicer in one spot while being used. This Kalorick Electric Meat Slicer is on the list of best meat slicers because it has some great features to offer. The first thing to notice is the housing part of the equipment. It is made of an aluminum-alloy material and can be easily cleaned. There is a thumb guard to make you feel better about slicing your food. Some people are nervous about using these because there are meat slicer reviews that mention cutting your fingers. With this thumb guard, there is almost nothing to worry about. The tray carriage is great because you can fit large pieces of meat and cheese blocks on it to make it easier to slice the food. There are nonslip rubber feet to ensure you aren’t moving all around the counter while you are using this slicer. The serrated blade is made from stainless-steel and has a locking device for safety reasons. This blade can be moved to control the thickness of the slices you are producing. This is ideal for your frozen meats and vegetables. You no longer have to wait for your frozen foods to thaw out then slice them. This 15 x 8 x 10 inch machine will fit perfectly next to a toaster or conveniently in a cabinet. Just like the other meat slicer reviews, this one has many features to offer. The Dani 14160 has an ac motor with 150 watts of power. This is great because it can cut through thick frozen foods and thick meats. There is a knob on the front of the slicer that is used to adjust the thickness level. This is great for when you want to slice thick pieces of fruit then very thin pieces of meat for lunch sandwiches. The stainless steel blade measures in at 7 ½ inches in diameter. This is great because there are many other slicers on the market that have smaller blades. That is what puts this on the best meat slicer list. The other feature that puts this appliance on the best meat slicer list is the built in handles. This is great for moving the slicer around the kitchen without having to take it apart. This 1800-watt toaster is one of the best because of the versatility it offers. There are four slots to toast four slices of bread at once. This is great because instead of only making one sandwich at a time and making others wait, you can make two sandwiches at the same time. If you keep your bread frozen in the freezer to keep it fresh longer, you no longer have to let it thaw in the fridge for a day. 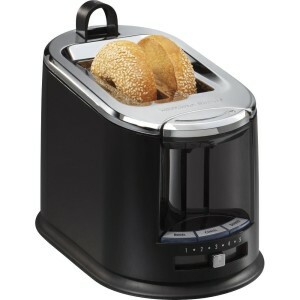 There is a defrost option on this monster of a toaster that will work with bagels, breads and even croissants. Just like all other toasters, you are able to control the level of toasted-ness you want for your bread. The feature that sets this toaster apart from the others is the additional tray that is attached on the side. This tray has two purposes. You can use it to cook your eggs or to warm your meat, fruit or vegetables. For the egg purposes, you can easily cook them to your liking. Whether you like your eggs scrambled, over easy or even poached, this toaster will accommodate your taste. You can even hard or soft boil up to 8 eggs in the basket attachment. If you would rather warm your precooked meat, you can simply place your meat or vegetables on the tray and heat them up according to your preferences. You will definitely get your money’s worth with this amazing toaster/egg cooker combination. Technology is slowly taking over everything we use in our daily lives. This includes small kitchen appliances. This toaster is called a smart toaster because of the extravagant LED panel. There are 900 watts behind this machine to help produce the perfectly toasted bread. The great thing about this brand is you have the option of purchasing a two-slice toaster or a four-slice toaster depending on your preferences. There are a few different push button controls on the top of the toaster that are backlit by the LED panel. These buttons can control whether you want to defrost, toast, lift and look at the product or if you want to toast a bagel. The outside appearance of this toaster is what sets it apart from the others. The metal housing is actually brushed metal and a die-cast housing. The sleek curves and shine this toaster has will attract your eye in seconds. Instead of the annoying buzzer some of the other toasters have, this one has a beep that goes off at the end of a cycle. When you purchase this toaster, you will not only get what you paid for, you will also get a 1 year warranty to ensure nothing goes wrong with your applian ce. If you like a simple toaster with a little bit of flair, this is perfect for you. This two slice toaster is available in black or apple red to make it easy to fit your stylish needs in your kitchen. Some toasters get extremely hot while they are on and working. This toaster, on the other hand, has an exterior that is cool to the touch at all times. You no longer have to worry about burning your fingers when you try to get your toast out of the appliance. If you are still worried about the heat, this toaster comes with heat friendly tongs so you don’t have to touch the machine at all. If the toast gets jammed in the appliance, it will automatically shut off to ensure your safety. Another safety feature this toaster offers is the shock-resistant heating elements. If you are always worried about getting shocked or burning your fingers when you are making toast, you should invest in this toaster. 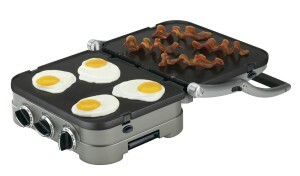 You will no longer have to worry about getting hurt while making your breakfast in the morning. Just like other toasters, you can control the heat setting to ensure the perfect level of toasting. You will also be able to choose between toasting a bagel, defrosting bread or cancelling the toast all together with the three buttons on the front of the machine. The latest and greatest thing when it comes to toasters is the ease of using the machine. The easier an appliance is to use, the more popular they are. This toaster is the epitome is easy when it comes to usage. There are three different push buttons on the front of the appliance. These buttons are bagel, defrost and reheat. There are two of each of these buttons, one for each side of the toaster. You can perform two different functions at the same time with this toaster. Instead of only toasting 4 slices of bread, you can toast 2 slices and defrost 2 slices at the same time. 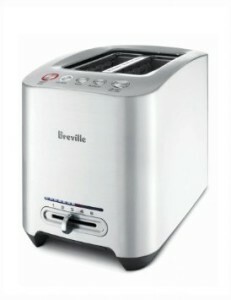 Unlike other toasters that have a lever, you don’t need to push anything for the toast to pop up with this one. This toaster contains a motorized lift with an LCD countdown feature. You won’t have to worry about running to the toaster when you hear it buzz and pop up. The timer will let you know when it is about to be done and the pieces of toast will slowly rise up with the help of the motorized lift. Another great thing about this toaster is the internal cord wrap. Instead of taking up a ton of space on the counter, the cord wraps up under the toaster for easy storing and a neat display. If you are looking for something new and innovative to place in your modern styled kitchen, this glass toaster is calling your name. The main feature of this toaster is clearly the glass panels. Instead of only seeing your toast from the top, you can sit back and view your toast from the side. This is great for children because they love watching things work like this. You can stick two slices of bread in this toaster, watch them turn into toast and pop out minutes later. Another great function about this toaster is its setup. Instead of two slots side by side, this one has one long slot to fit two pieces of bread in the same slot at the same time. There is a great auto-centering guide to ensure your bread will receive an even toast all the way around. Some toaster ovens are hotter towards one end and toast your bread more on one side. 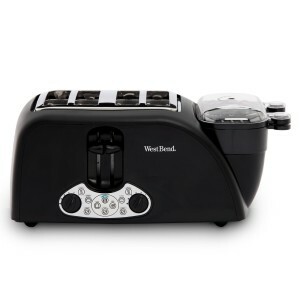 You will now have perfectly toasted bread almost every time. The knob for the browning function is also adjustable to ensure you don’t burn your toast. You can toast your bread and bagels, reheat and defrost your food, and cancel the toaster at any time with the control buttons. 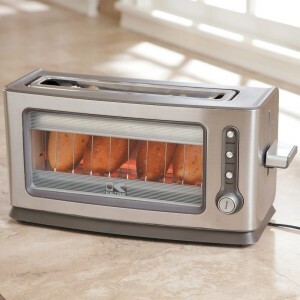 This toaster is one of the best buys for the price especially with the sleek glass paneling design. Whether you are moving into a new home or need something to buy for a friend, a cookware set can never be a bad gift to receive. To find the best cookware set you first must search through tons of cookware set reviews. 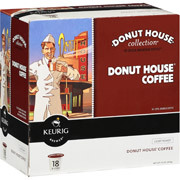 These reviews will show the top brands for the best price. 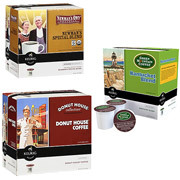 Cuisinart is one of the top brands when it comes to everything in the kitchen. They make no exception when it came to their cookware set. This set in particular comes with 10 different pieces. 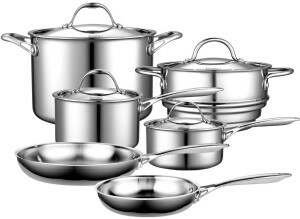 There aren’t too many cookware sets that come with that many pieces for such a great price. Each piece is constructed with stainless steel that has a mirror finish. These pots and pans are so attractive to look at, you might not want to use them! The handles on these items are very solid and come with rivets to ensure the sturdiness of them. there is aluminum in the base to give the absolute best and even heating possible. 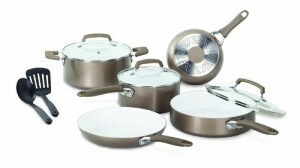 The ten pieces that come with this set include a few different types of pots and pans. You will get two different skillets. There will be at 8-inch skillet and also a 10-inch skillet. There are two covered saucepans as well in this kit. Both the 1/5 and 3 quart sauce pans come with matching lids. The sauté pan you will get comes with a cover as well and can hold 3.5 quarts. The last items are an 8 quart stockpot with the matching cover. You will not be sorry when you purchase this set or give it as a gift to someone else. It is one of the best ways to get a new home started or welcome someone to the neighborhood. T-fal is an extremely well known company when it comes to cooking products. They produce top notch cooking pans and pots and use a wide variety of materials to ensure even cooking and nonstick features. With this set, you will get 12 different pieces to add to your kitchen or a family members kitchen. There are two fry pans included, one 8 inches and one 10.5 inches. This is great because you can never have too many fry pans in your cookware collection. You will also get three different sauce pans. You will get a 1-quart, 2-quart and 3-quart sauce pans. This is great because now you can cook multiple things at the same time instead of waiting and washing one pan over and over again. The last cooking pot you will get is a 5.5 quart dutch oven with a matching cover. The other two items that make up the 12 are a slotted turner and spoon. All of the pots and pans are constructed with stainless-steel with multiple layers in the bases. These layers consist of aluminum, copper and steel to ensure even heating throughout the pan. The handles are stainless-steel as well and riveted to the pots. You no longer have to worry about the handle falling off and your entire meal landing on the ground. There are glass lids for the pots to lock in the nutrients, heat and moisture. It will also look in the flavors and keep everything very tasteful. There are a few things too look for when reading cookware set reviews. You probably want your cookware set to be scratch resistant and nonstick. You would want this because no one likes it when their food gets caked onto the frying pan. It can also be harmful if the material in the frying pan gets scratched up and you ingest it. These Wearever pans have 3 very important features. The first is the superior scratch resistance. You wont have to worry about finding flakes of your frying pan in your eggs. The second feature is the durable ceramic aspect. Every piece of cookware is coated with a ceramic material. The last great feature is superior stain resistance. A lot of the other cookware sets that have a color to them end up with stains from the grease that is used. These will not ever be stained no matter what you decide to cook. This set is available in two different colors. If you like the generic color of cookware sets, the gold set is perfect for you. If you like adding a little bit of color to your kitchen, the red set is ideal. Both sets come with 10 pieces of cooking pieces. You will get one big stock pot, two frying pans, one sauté pan and a sauce pot. Three of those come with matching lids. You will also get a spatula and a spoon to add to your kitchen. Everyone knows how popular Paula Deen is. She has many recipe books and videos that people can purchase and use to learn how to cook. Paula actually makes a well-polished and durable cookware set. This set in particular has 15 pieces in it. These pieces include 1 and 2 quart covered saucepans, a 6 quart covered saucepot, a 2.75 quart covered sauté pan, an 8 and 10 inch skillet and an additional measuring spoon set with 5 spoons. 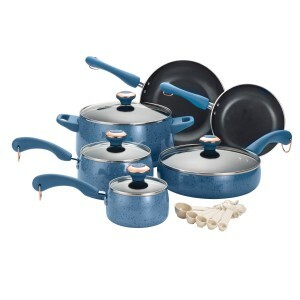 One of the best things about this cookware set is the vibrant blue color of the exterior of the pots and pans. You no longer have to look at boring black and silver cookware sets in your kitchen. There are more great features about this Paula Deen cookware set that some other cookware sets don’t address. The interior of every pot and pan in this set is coated in a specific nonstick material. This material is a DuPont Teflon created to make your foods not bind to the cookware. The exterior of these items are all created with porcelain enamel. This material is completely stain resistant, easy to clean and extremely durable. You wont have to constantly buy new cookware sets after you purchase this one. You can cook up to 350 degrees in the oven with these pots and pans. That means you no longer have to only use the stove top to make your dinner creations. The price might be a little higher but it will be worth the money when you can keep using it for many years. When it comes to cookware sets, you don’t want to skimp out on quality even if that means spending a few extra dollars. This Cooks cookware set is the perfect set that combines quality with a good price. 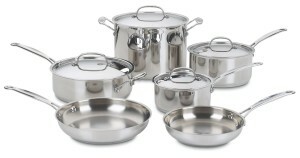 This set is completely stainless steel and not only has a great usage feature, but also a fantastic look to it. There are 10 great pieces that make up this cookware set. You will get two saucepans with matching lids. The two sauce pans are a 1.5 quart one and a 3 quart one. There are also two open skillets in this set. You will get an 8 inch skillet and a 10 inch skillet. These do not come with matching lids but most of the stuff you cook in a skillet do not require a lid. There is an 8 inch stockpot with matching lid and an extra item as well. This extra item is a steamer insert that is completely covered and great for steaming vegetables. There are 2 layers of stainless steel on each item in this set. Between these two layers is an aluminum core that ensures even heating all around. 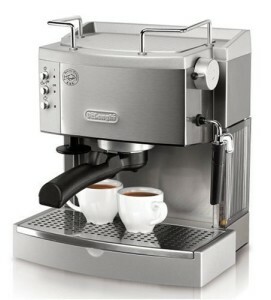 The handles are stainless steel and solidly riveted to each piece. This allows the handles to stay cool to the touch so you don’t have to worry about burning your hands when you pick the pans up. The lids are a perfect fit to each item so no heat leaks out. One of the best features of this set is the pieces are safe in up to 500 degrees in an oven. That is almost twice as much heat as others in this review. The Holidays are the best times to start buying kitchen appliances. There is always someone who needs something new to complete their kitchen every year. These slow cookers reviews will help you narrow down your search for the best slow cooker you can find. Whether you are purchasing one for a family member, friend or even yourself, you always want to read some slow cookers reviews before you make your final choice. Hamilton Beach is known for their top notch appliances. This insulated slow cooker is no exception to that rule. The design behind this item is to make it more user friendly when it comes to cooking your food. The base of the cooker has insulated sides to make sure the outside stays cooler than most of the competitors cookers. 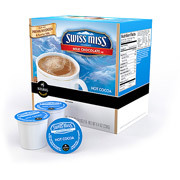 This is great for any kitchen because it will not heat up an entire room while it is running. This is ideal for meats that are cooked on a stove and need to finish cooking over a longer period of time. The cooker insert pan is made of aluminum and is nonstick. This makes it very convenient to take it out and stick it in the dishwasher. The insulation portion of the slow cooker helps conserve energy in any home. You will notice a difference with your power bill if you are currently using a regular slow cooker and switch to this insulated slow cooker. The programmability is one of the easiest of the slow cookers in the reviews. You only need to set the temperature at which you want to cook your food and the time at which you want to leave it in the cooker. Slow cookers have been around for a very long time. They are great for making soups, stews, chilis, and many other dishes that require a long and slow cook time. They have evolved into very popular and useful pieces of equipment. The Cuisinart slow cooker is great because it is available in two different sizes; 4 quarts and 6 quarts. The 6 quart slow cooker is more practical because most recipes call for that size of a container. There are many different features that slow cookers reviews highlight about this particular one. The main feature to highlight is the fact that the parts are dishwasher safe. This means you don’t have to spend tons of time cleaning the slow cooker. You can take the parts that are dishwasher safe out, and wipe down the rest and you’re done. The actual cooking pot that is 6 quarts is aluminum and is removable. This makes it easy to clean up when you are finished cooking. There is also an LCD display that is backlit to make it easier to read the buttons and the functions of this cooker. The lid is glass and clear to let you see inside the cooker while it is working. The glass part keeps it cool to the touch so you can easily list it up without burning your fingers. If your recipe calls for some combination cooking, you can simply change the mode on the cooker with one touch of a button. This slow cooker can do 3 things in 1 and will save you time and money when it comes to preparing meals. The best words to hear when it comes to cooking food is “set and forget”. This means you can set up your dinner to start cooking, walk away and let your food cook all day. These slow cookers reviews highlight the important features of each cooker. The main feature of this Hamilton slow cooker is the programmable cooking options. These options are program, manual and a probe option. There is also a function that is call automatic keep=warm that will keep cooked foods warm while you are finishing up chores. The probe is great because it shows the temperature so you can monitor your meats at all times. The cooker portion can hold up to 6 quarts of material and has a display screen with an LED digital control panel. This makes it very easy to use the buttons and see the screen even at night. There are some features this slow cooker has that others do not. With the cooker itself, you will receive a clip-on spoon, clip-tight basket lid and side handles that make it safer to transport the equipment. The stoneware with the cooker is completely dishwasher safe and the lid is made of a tempered-glass. Another special feature you will receive is a user manual with different recipes to get your creative juices flowing. The majority of the best slow cookers come in an oval shape and can sometimes fit awkwardly on a kitchen counter. Cuisinart has once again out done themselves by making a rectangular slow cooker that fits perfectly in the corner on any kitchen counter. The inside cooking portion of this appliance is in the shape of an oval. Most of the cooking pots in the other slow cookers are made of aluminum. This one on the other hand is made of a ceramic material. This means the slow cooker will stay warmer on the inside for a longer period of time than those that use aluminum pots. There are 3 different modes of cook time. You can program it to cook low, high and just simmer. Unlike the other slow cookers, this one comes with a cord storage area. You don’t have to worry about wrapping the cord up and tying it off with a rubber band. There is a glass lid that comes with a stainless steel rim. 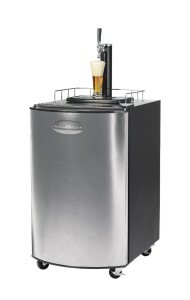 There are also chrome handles that stay cool so you can easily pick up the appliances at any time. Included with the slow cooker is a cooking rack, instruction book and even a recipe book to help give you some cooking ideas. There is even a 3 year limited warranty included. One of the greatest things about slow cookers reviews is finding one in the perfect color for your kitchen. Most are only available in a black or a dark metal color. This Crock-Potslow cooker comes in a stainless steel color that brings an element of modernism to any kitchen. This is an oval shaped slow cooker that holds up to 6.5 quarts. That is a little bigger than some of the other ones in the slow cookers reviews. The crock portion is stoneware and is removable to be dishwasher safe. The only other portion you need to clean is the glass lid and the apparatus as a whole. Since most of the food particles will be inside the removable crock, you can simply wipe out the appliance and clean the lid and be completely done. 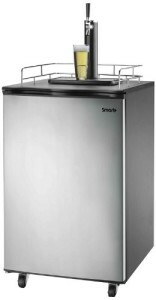 The exterior of the appliance is stainless steel that is polished to give a unique look. The handles are covered with silicone wraps to keep them cool to the touch. This makes it very easy for you to pick up the crock pot even when it is hot and cooking. The control panel is completely touch screen with some different useful features. There is a programmable cook time feature that will allow you to set it for different time limits and different types of food you are cooking. There is also an auto keep warm feature that will let you keep already cooked foods warm for a longer amount of time. You might have heard of Frigidaireproducing larger kitchen appliances like refrigerators and ovens but didn’t know they made small kitchen appliances as well. They are known for having good products and have one of the best slow cookers around. Slow cookers reviews usually talk about the usage features of the products but this will show how they combine the outer look and inside function into one review. This slow cooker uses a spacewise design to ensure it utilizes as much space inside the cooker without taking a ton of counter space up. The outside is made with a stainless steel that is very stylish and adds a luxurious feel to any kitchen. There are two pro-select features that make this slow cooker in its own level of professionalism. The LED display is one of the PRO-select features that makes it very easy to see and use the control buttons. The other PRO-select feature is the one-touch option. This lets you hit one button to program the cooker to make an entire meal. At a reasonable price, you won’t have to worry about breaking the bank, will get free shipping, and end up with a modern and stylish slow cooker. 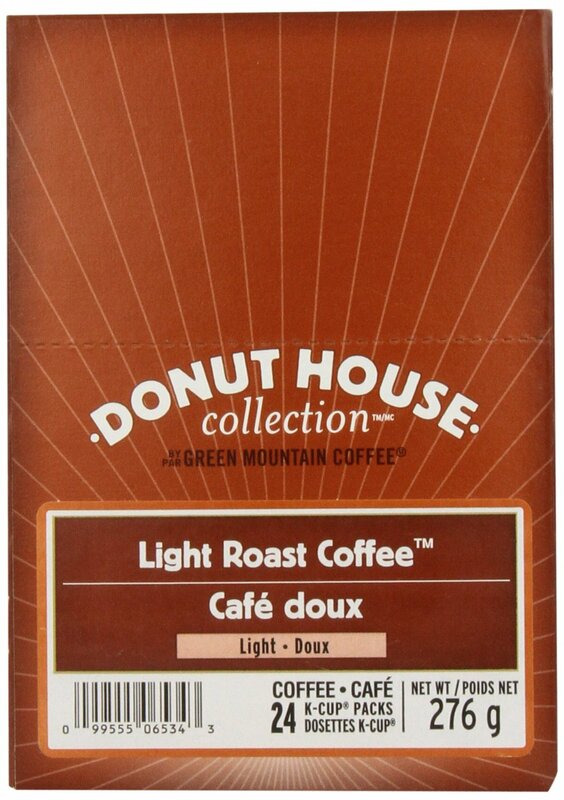 The best part of this entire thing is the fact that it holds a whopping 7 quarts of ingredients! Are you tired of the mess and splattering grease? 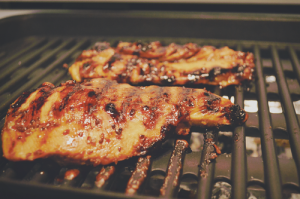 Are you tired of grilling meat on a barbecue grill? Would you like a device that allows you to cook a wide variety of meats and vegetables with minimal fuss and maximum control? Sick of having to clean up a traditional grill after you’re done cooking? Looking for a grilling solution that fits right on your counter-top? If you answered yes to any of the above, you should consider a counter-top griddle griller. These hybrid devices are fast becoming quite popular due to the convenience and easy grilling they bring to your counter-top. Also, many home chefs prize the versatility of these devices because you get to grill and griddle at the same time. You can also use these nifty devices as sandwich presses. Sounds real great, right? Well, just like with any hot market, there are a wide range of product devices that all aim to meet your grilling needs in a wide variety of ways. Sadly, they don’t all hit the mark. If you want to make sure that you get every red cent’s worth of value for every hard-earned dollar you spend on these devices, keep reading below so you can get all the information you need to make a truly informed decision. Take your counter-top grilling to the next level without it burning a hole through your pocket. Since these units will go on your counter-top, you need to pay attention to the following features so you can get maximum value for your money: grilling/griddle versatility, footprint, ease of cleaning, ease of operation. Coming in at a convenient 11.5 inch x 13.5 inch x 7.1 inch footprint, this 8 pound unit is designed for optimal counter-top grilling without hogging up too much of your counter-top’s precious real estate. Decked out in brushed stainless steel, this unit has a rugged heavy-duty feel to it. You can tell that this unit can take whatever meat, vegetables, or bread you pop inside it. Its front knobs make operation very intuitive, easy, and quick. Grilling power: As the Cuisinart GR-4N 5-in-1 Griddler’s name says, this unit has many uses which expands its grilling power. 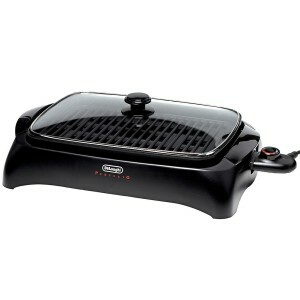 It is a grill, half-grill, half-griddle, full-griddle, panini or sandwich press. Due to this versatility, you can cook a wide range of sandwiches, meat, veggies, and meals with this unit. Footprint: This unit has a very decent footprint that doesn’t eat up too much space: 11.5 inch x 13.5 inch x 7.1 inch. 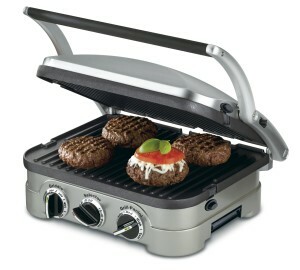 Ease of cleaning: Cuisinart GR-4N 5-in-1 Griddler has a non-stick lining which makes clean up a quick and easy affair. In fact, if you cook normal meals with this unit, you shouldn’t have a tough time keeping the unit clean. You simply need to wipe down the grill surface after unplugging it and letting it cool off. Ease of operation: With easy access knobs in front with clear labeling, this unit is very easy to operate. No guess work needed. If you are looking to whip together a great sandwich or a half dozen slider burgers or some hot dogs or some bacon and eggs, you simply can’t go wrong with the Cuisinart GR-4N 5-in-1 Griddler. 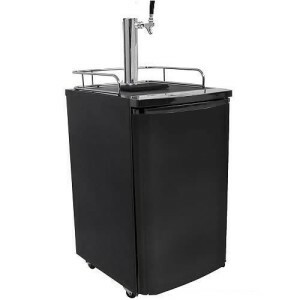 Not only is this unit easy to operate, clean, and store, it is also extremely versatile. You get a full grill, a half grill, a full griddle, a half griddle, and a sandwich press-all in one compact and kitchen-friendly footprint. 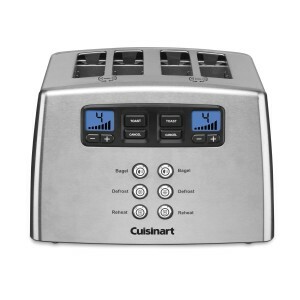 It seems that Cuisinart paid close attention to the wish lists of many home grillers and home made grilled sandwich fans. If you’re looking to sink your teeth into a crispy, hot, fresh, and yummy-tasting homemade grilled cheese sandwich, hotdog, burger, bacon and eggs, and everything else in between, you need to check out the Cuisinart GR-4N 5-in-1 Griddler. When trying to choose among many counter-top grilling appliances, you should focus on the following features to maximize the value you get for your hard-earned money: grilling power, footprint, ease of cleaning, ease of operation. Delonghi BG24 Perfecto Indoor Grill 2 Just judging by its large, squat appearance, you can tell immediately that the Delonghi BG24 Perfecto Indoor Grill means business. If you like to grill large amounts of food at once and the phrase ‘family-sized’ applies to the meals you prepare in one sitting, the Delonghi BG24 Perfecto Indoor Grill is designed to handle the job easily. 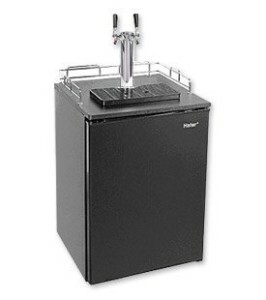 It has the capacity and ease-of-use you need to take care of very beefy batches. Whether you’re cooking for your family and some friends and relatives or you’re cooking for a small party, the Delonghi BG24 Perfecto Indoor Grill can handle whatever you throw at it. Its claim to fame, however, is its enhanced heating system to ensure that whatever meals you grill come out evenly cooked. Grilling power: If you’ve been struggling with unevenly grilled meats, the Delonghi BG24 Perfecto Indoor Grill solves all your problems. Its improved heating element makes sure that your cook is evenly cooked and heat goes where its needed. Say good-bye to burgers with charred exteriors and frozen interiors! Moreover, this unit’s grilling power is enhanced by its thick lid which traps cooking heat efficiently. Footprint: This unit has a sizable footprint but it doesn’t completely take over your counter-top. It needs to have this footprint because it carries a hefty 12 inch x 6 inch cooking surface which can handle large family-sized grilled meals. Ease of cleaning: Cleaning up this unit is very easy. All drippings fall on the drip tray so you only need to remove it to clean this appliance. Say goodbye to messy outdoor grills or hard-to-clean indoor grill surfaces. Ease of operation: This electric unit’s thermostat, plug, and parts are easy to configure and understand. Totally intuitive design. Affordable, easy to handle, easy to use, easy to clean, and beefy, the Delonghi BG24 Perfecto Indoor Grill answers the needs of most family grillers. If you like serving up large grilled meals for your family and friends, this unit is designed for you. Very easy to use and maintain, the Delonghi BG24 Perfecto Indoor Grill makes healthy indoor grilling fun, convenient, and easy. Take a break from the same boring mac and cheese or noodle dinners with this grilling powerhouse. Grilling has never been this fun, versatile, and easy. If you are a big BBQ fan and an outdoor grilling afficionado, indoor grilling might seem like, well, quite a letdown to you. You might feel that indoor grills don’t have the dimensions, the heating power, and, yes, the attitude of outdoor grills. While it is impossible to recreate the distinct joys of outdoor grilling indoors-the warm summer breeze, the chirping birds, that glorious sunlight, the bees, and outdoor flag football and frisbee action, you can recreate the same grilling quality you’d get with heavy duty outdoor BBQ units with heavy duty indoor grills. 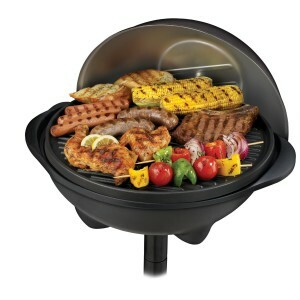 Recreating the thrill of outdoor grilling is precisely the task heavy duty indoor grills were invented for. If you think that indoor grilling has to necessarily involve glorified sandwich or panini presses, prepare to get your mind blown when looking at full-sized and full-blown indoor grilling units that can be used as easily outdoors as indoors. These units have the personality and attitude you’d expect from beefy outdoor contraptions you use for grilling with all the protections and ease of cleaning you’d expect from outdoor grills. If you want to enjoy some of the feel, thrill, and grilling power of outdoor grills indoors, you need to check out indoor/outdoor grill units. These versatile units are engineered to offer you the best of both worlds. If your next grilling adventure in the park is rained out, you don’t have to let Mother Nature rain on your parade-you can grill indoors with this type of grill and continue to party. Maximize the value of your hard-earned money by paying close attention to the selection criteria listed below. They help ensure you make a truly informed decision when looking for the heavy duty grilling devices. If you want to get the most value for your money when buying heavy duty indoor grills, you need to consider the following factors: grilling power, footprint/design, ease of cleaning, ease of operation. If you think the George Foreman GGR50B Indoor/Outdoor Grill looks just like your typical outdoor grill, the look’s intentional. It doesn’t just mimic an outdoor grill, it also gives you full grilling power in an indoor setting. Let’s face it the gold standard for grilling is outdoor grilling. Most grilling aficionados, whether newbies or veterans, agree that the best grilling experiences are provided by traditional outdoor grills. They say this because outdoor grills are the right size, pack the right level of heat, and deliver optimal cooking results. Indoor grillers, however, have their own needs too. They insist on devices that are easy to clean, run on electricity, and have efficient grease handling systems. If you’d like maximum flexibility and would like a grill that you can use as easily outdoors as indoors and which delivers solid results each time, you can’t go wrong with the George Foreman GGR50B Indoor/Outdoor Grill. Grilling power: One of the biggest hassles of traditional grills is that they take their sweet time to heat up. This unit delivers the heat you’re looking for quickly and efficiently. Not bad considering that this unit is an electrical indoor unit. 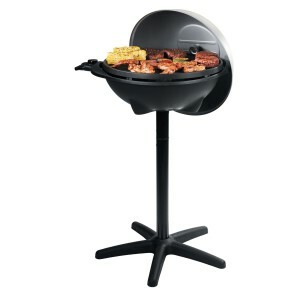 Footprint: Mimicking a traditional outdoor grill, the George Foreman GGR50B Indoor/Outdoor Grill is extremely versatile. You can use it indoors by taking it off the pedestal and placing it on your counter-top. However, if its sunny out there, you put it on its pedestal and enjoy the great outdoors. Quick and easy installation meets portability and convenience. Ease of cleaning: This unit has a sloping grilling surface so grease is easy to clean off. Also, the surface is strategically designed so the grease doesn’t pool if you position the unit properly. Ease of operation: This device’s parts are easy to put together, use, and disassemble. There’s a reason why the phrase ‘George Foreman grill’ has been a mainstay among indoor grillers for going over a decade now. While purists might still think that indoor grilling is a pale version of the distinct thrills of outdoor charcoal grilling, if you are looking for great grilled meals and don’t have to worry about cleaning up the mess later, the George Foreman GGR50B Indoor/Outdoor Grill is the solution you’ve been waiting for. Pick up this unit and join the ranks of millions of Americans who have discovered the distinct joys of indoor grilling. One of the latest and greatest kitchen appliances these days is a food dehydrator. Tons of people have started eating dried fruits and vegetables as well as jerky meat. The process of dehydrating food items helps preserve the nutrients will altering the look and taste of the food. You don’t have to eat your fruits and vegetables raw anymore to get all of the nutrients possible. These food dehydrator reviews will showcase the best of the best when it comes to the process of dehydrating food. Nesco makes a few different types of food dehydrators. This FD-1040 model is different from the others in a few ways. The first feature that differentiates this food dehydrator from others is the digital timer that is programmable. You can program this appliance to dehydrate certain foods for certain amounts of time if you are running errands or even working. The next feature that makes this one better than some of the others in dehydrator reviews is the drying power. There are 1000 watts of power backing up this appliance to dry just about any food you can imagine. There are 4 different trays included with this dehydrator. That means you can dry out tons of different food items at the same time without their flavors crossing paths. The temperature control is adjustable as well. If certain foods need a higher tempatuer, you can dry those ones first then change the temperature and dry the other foods. There is even a converge-flow air flow system that is completely patented. One of the best thigns about this product is the fact that it is expandable. Most of the appliances can only be used as they are with multiple attachments. You can add up to 20 trays to this dehydrator to make it one of the most efficient and effective dehydrators on the market. 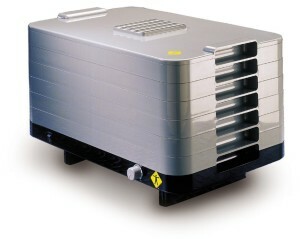 Excalibur is another brand who produces many food dehydrators. 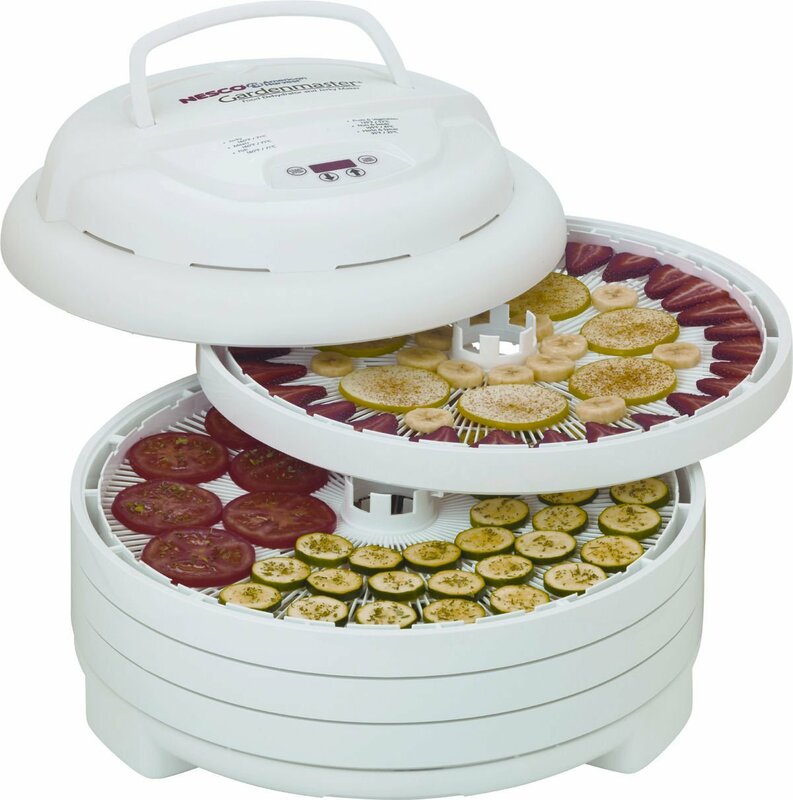 This Deluxe dehydrator is one of the best ones put on the market. There are 9 trays inside the dehydrator. This allows for even drying on 9 different levels. You can fit a lot of food items in the appliance at once so you don’t have to do multiple uses. There’s a total of 15 square feet of drying space in this appliance. That is more than most of the others in dehydrator reviews. There is even an on/off switch that is built into the appliance. The thermostat is completely adjustable. You can change the temperature to accommodate any food items you want to dry out. This food dehydrator in particular is more for large families. It can also be for a small family that has a garden in the back yard. You can grow your own vegetables and fruits and take them right to the dehydrator. This will lock in the nutrients and give you a variety on textures and flavors. The polyscreen trays are inserts that are designed to be easy to clean. The price is a little higher than some of the other dehydrators because of the size and versatility. It is also available in two colors. You can get it in a dark black or in a bright white. You might not recognize the brand L’Equip but this dehydrator is considered to be one of the best food dehydrators out there. Most of the dehydrators out there only promote the fact that they dehydrate food products. This one also mentions you can dry herbs and flowers along with food products. There is a 500-watt dehydrator powering the machine so you can dry many different items at once. The thermostat is adjustable so you can have a variety of drying temperatures. There is also a sensor inside that is computer-controlled. This gives a modern look and feel to the dehydrator. In total, there is 12 square feet of drying space. There are 6 stackable trays to let you dry a ton of different items at one time. You can separate the fruits from the vegetables and even put some herbs in there without the flavors being crossed. This particular dehydrator measures 17 inches by 11.45 inches by 10.5 inches. There is a 10 year warranty with this product. It even comes with a booklet with different drying times and recipes. The sleek metal look of the outside of this dehydrator will add a futuristic look and feel to any kitchen. Nesco has done it again with this best food dehydrator. There are many other food dehydrator reviews out there but this might be one of the best. There is a whopping 1000-watts of drying power included in this little machine. Most of the other food dehydrators do not have that much drying power included. The thermostat is completely adjustable. This means you can dry just about anything you want with the switch of the thermostat. This makes it versatile to many different foods/flowers/herbs. 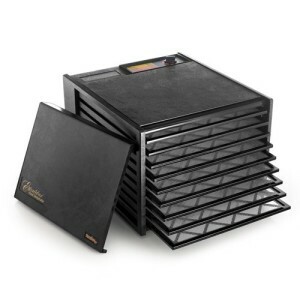 This dehydrator in particular can be expanded to 30 trays. That is almost double some of the others in these food dehydrator reviews. 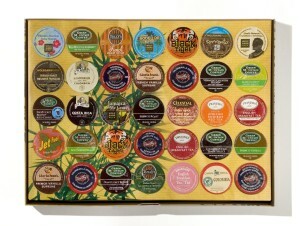 The 30 trays allows for an immense amount of items to be dried at the same time. The best feature about this dehydrator is the fact that it comes with many different options. With the dehydrator, you will get 8 trays, 8 fruit rolls and 8 clean a screens. 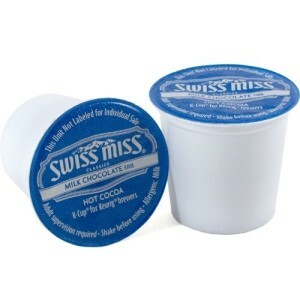 The trays can also be bought separately to expand the machine. The fruit rolls are great to make your own fruit candies. This will make them much healthier for you and will probably taste much better as well. You will also get a little book that will help you when it comes to drying the foods. If you have never tried drying foods, this book will become your best friend. Excalibur is one of the best when it comes to food dehydrator reviews. They produce only the best of the best in the food dehydrator business. This particular dehydrator only has 5 trays but the power makes up for the lack of trays. There is a total of 8 square feet of drying space once everything is assembled. This dehydrator is meant to accommodate families with small gardens in their backyard. They can pick their fruits, vegetables and herbs and dry them out in a few simple steps. 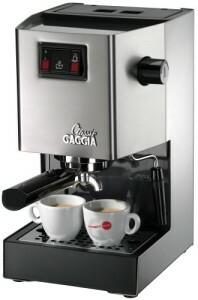 There is an on/off switch that is built into the machine and very easy to use. 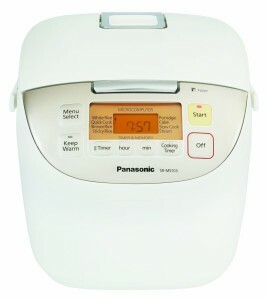 The thermostat is adjustable as well to help you achieve the perfect temperature to dry your ingredients. 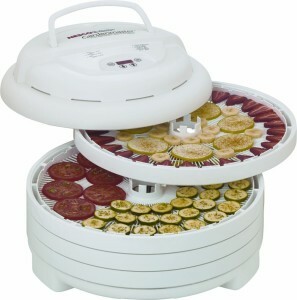 One of the best things about this dehydrator is the face that it is available in 2 different colors. You can now match your dehydrator to your kitchen appliances. 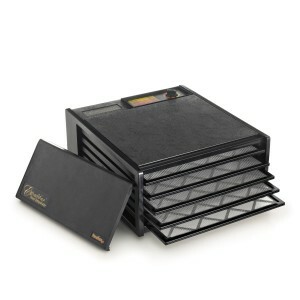 If you have all black appliances in your kitchen, you can purchase the black food dehydrator. If you have all white appliances, you can purchase the white dehydrator. 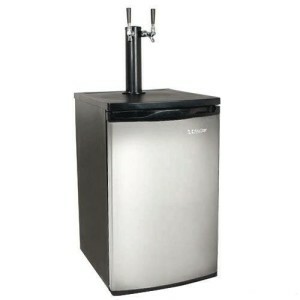 The black one will also look good with stainless steel appliances. The Polyscreen tray inserts are removable and very easy to clean. All in all this food dehydrator is one of the best. Regardless of whether you’re buying food dehydrators or any other type of kitchen appliance online, you have to remember to be very strategic. It is very easy to get caught up in the supposed benefits of buying through e-commerce websites. However, if you don’t have a clear plan as to the items that you are buying as well as researching the items that you are buying, you might end up spending a lot more money buying stuff on-line and returning such items than if you had bought such items from a brick and mortar shop. Keep the following tips in mind so you can fully unleash the power of the Internet in your on-line buying efforts. Make the Internet work for you by being strategic when buying food dehydrators online. Thanks to specialized websites called price comparison engines, you only need to enter a brand or model or even machine type into a search box to find the best prices. You can enter the phrase food dehydrators into price comparison engine, and the engine will spit out different makes and models along with their prize. You can then zero in on the best value. However, you have to be very clear when using these types of websites. You have to pay attention to what you’re doing otherwise you might end up buying the wrong model. There are many food dehydrators out there. All are not created equal. Some are better deals than others. If you just compare based on price, you might be making the wrong decision. You have to pay attention to the other data points and other elements to ensure that you make a truly informed choice. After you’ve used price comparison engine, you will see all sorts of mix and models. You will see all sorts of prices. It’s too easy to give into the temptation of just buying the cheapest model. However, if you do this, you might be shooting yourself in the foot. Chances are, the features of that particular brand of food dehydrators may be different from what you’re actually looking for. Besides just comparing prices, you should also compare features. More importantly, you have to compare features correctly. In other words, you have to avoid comparing apples to oranges. Many manufacturers label certain features using terms that are similar to labels used by other manufacturers. However, they are talking about different things. Similarly, sometimes manufacturers use different terms to describe the same overall feature. The key to successfully avoid comparing apples to oranges is to focus on features instead of labels. When you pay attention to the actual behavior of the food dehydrators that you are comparing, you increase your chances of comparing the right features. Thanks to the concept of OEM (Original Equipment Manufacturer), chances are, the different brands of food dehydrators that you’re comparing might actually be made by the same manufacturer in China. That’s how OEM works. The same manufacturer produces different products, but different brands are slapped on those products. At the end of the day, it’s still the same manufacturer. Use this fact to your advantage by looking past brands. Instead, focus on the functions and the warranties that come with the products that you are comparing. When you do this, you are actually focusing on the intrinsic value of the food dehydrators that you are comparing instead of getting caught up in the brands. The truth is you pay a premium for brands and in many cases, the premium may be too much. Keep the tips above in mind when comparing food dehydrators. They can mean the difference between you walking away with a good and walking away with a bum deal. 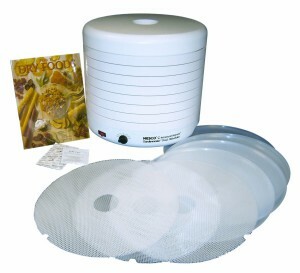 Food dehydrators are bought and sold all the time on-line. Use tried and proven on-line shopping strategies to ensure you walk away with the best deal possible. Have you ever been to a restaurant and had a bowl of rice that was cooked to absolute perfection? Now you can make that kind of rice from the comfort of your own home. These rice cooker reviews will help you find the best rice cooker for your needs and well within your budget. You no longer have to spend money going out to eat to get the perfect bowl of rice. When you think of the best rice cooker, a pressure cooker probably does not come to mind. 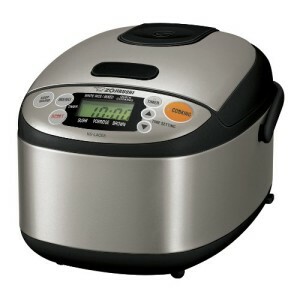 These rice cooker reviews will show a wide variety of cookers able to produce the best rice. 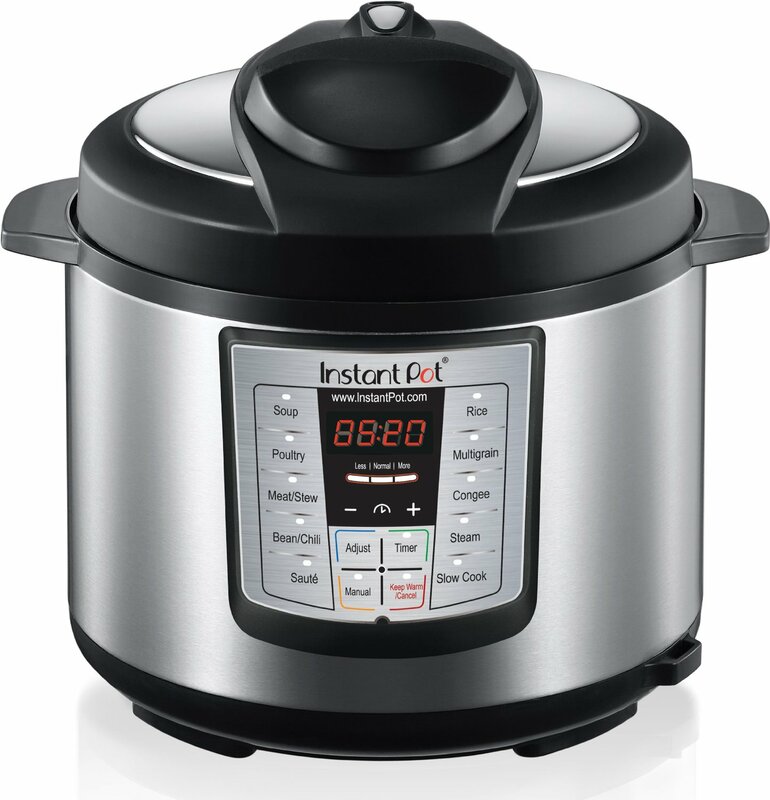 This Instant Pot pressure cooker has many different features, rice cooking being one of them. There are 6 different functions available in this one piece of equipment. 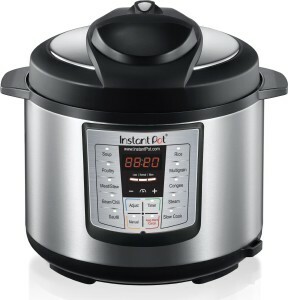 You can use this as a pressure cooker, sauté/browning, slow cooker, rice cooker, steamer and even a warmer. The possibilities are almost endless with this rice cooker. The panel on the front of the appliance is large enough to be easy to use but not tacky. There are 10 different smart programs that are built into the system. There is even a function to keep your food warm. There are also 3 different temperatures programmed for a slow cook and sauté/browning. If you want to let your rice cook while you are at work, you can set the delay timer for up to 24 hours. The timer will start when you tell it to and cook for up to 120 minutes non stop. This appliance is both UL and ULC certified and has 10 safety mechanisms. The safety features give most moms out there a better feeling of leaving it on while children are around. The cooking pot is made of stainless steel and has a 3-ply bottom. The steam rack included is also made from stainless steel. The outside has the look of stainless steel so it will complement the other appliances in your kitchen. When it comes to rice cooker reviews, this next one will make you want to buy one. 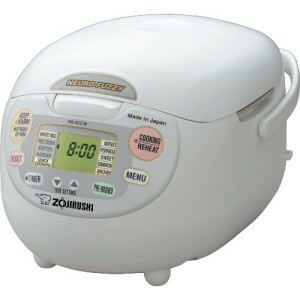 The Zojirushi Neuro rice cooker is one of the best on the market. It is small and compact and fits perfectly on just about any kitchen counter. It is also cute and round so it wont stand out against other appliances in your kitchen. There are two versions of this particular rice cooker. You can purchase this in the 1.0 liter version or the 1.8 liter version. The 1.0 liter rice cooker holds 5.5 cups of rice at one time. The 1.8 liter rice cooker holds up to 10 cups of rice at a time. Both of these come with a 1 year warranty. They come with 2 different measuring cups, a rice spoon holder, a nonstick rice spoon/scoop and multiple recipes. 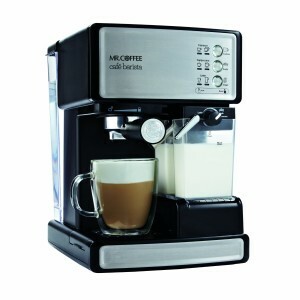 You wont be struggling to use this appliance with the included books and recipes. There is an inner pan that is spherical and nonstick. This allows for spherical heating and evenly cooked rice every time. The clock and timer are located on an LCD display to make it easy to see during the day and at night. The cord is even retractable so you don’t have to leave it laying around in your kitchen. There is an automatic keep warm function so you don’t have to worry about messing with it once you have cooked your rice. Both of these come with the advanced neuro fuzzy logic technology. Zojirushi has some of the best and most powerful rice cookers out there. They make a wide variety of the best rice cookers and they sell for a reasonable price. This Micom 3-Cup Rice cooker and warmer is great because it works as a cooker and warmer. This appliance in particular holds has a 3 cup capacity so I can cook 6 cups of rice perfectly every time. There are 6 different cooking functions included with this rice cooker. You can make white rice to eat or to make sushi rolls, sweet rice, brown rice, porridge, mixed rice and there is also a quick rice cooking setting. There is an inner cooking pan that is designed for even heating and better cooking. There are even some measuring lines in the inner cooking pan to ensure perfect measurements every time. This inner pan has a detachable inner lid as well. The outside of this rice cooker is very appealing to the eye. You can get this cooker in two different colors. There is a stainless steel and black combination or a stainless steel and white combination. Both are designed to match any kitchen. There is an LCD display on the front that is super easy to read and is user friendly. There are two different settings you can use to cook your rice. You can use the extended keep-warm setting or the reheating cycle. There is a delay timer so you can start your rice to cook while you are work for the day. You also don’t have to worry about wrapping the cord around the cooker when you are not using it. The cord automatically retracts into the appliance. This is small enough to fit perfectly in any corner. With the cooker you will also get a nonstick spatula made just for rice, a spatula holder and a measuring cup. When you think of Panasonic, you don’t generally think of something that cooks food. This Panasonic “Fuzzy Logic” Rice Cooker proves that you don’t have to be a food brand to make appliances. The whole point behind the fuzzy logic technology is to detect how much rice is being cooked. This little micro-computer then decides how much power to put out to ensure precise cooking and consistent results. You will almost always cook the perfect cup of rice with this rice cooker. To give a better taste to the rice, this company decided to make the pan black with white anodizing. Not only will have a perfectly cooked cup of rice, it will taste fantastic as well. The front display includes a 12-hour keep warm function, 24-hour clock and very large LCD read-out for ease of use. There is a menu select button on the front of the cooker. The menu options include slow cook, white/brown/sticky rice, porridge, 12-minute cook and cake and steam. The possibilities are almost endless when it comes to what you can do with this rice cooker. The exterior is a white color with chrome finish. It measures 13 inches by 10 inches by 8 inches and weighs roughly 7.5 pounds. 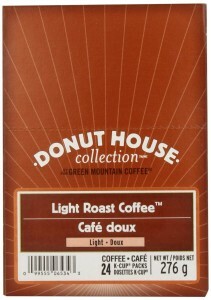 The small size is great for every kitchen. It also comes with a handle to make it easy to transport between locations. If you are looking for a rice cooker on a strict budget, this last one of the rice cooker reviews is perfect for you. This Miracle Exclusives rice cookers is cheaper than some of the other ones out there but works just as well. The cooking bowl is made of a stainless steel material and is very durable. There is also a stainless steel vegetable steamer tray included. This is great because now you can cook your rice and steam some vegetables to make a rice and vegetable combination. The lid is made of a clear glass to let you watch and check on the rice while it is being cooked. The other rice cookers do not have a feature like this. It can hold 8 cups of uncooked rice to produce 12 cups of cooked rice. You don’t have to worry about ingesting any Teflon or other nonstick surface materials with this rice cooker. Simply because there are none. There is an automatic cook mode and a keep warm mode. It comes in a white color for the base and the stainless steel steamer sits ontop of the cooker. This was made to be extremely user friendly so there aren’t any bells and whistles. Just simple rice cooking only. The problem with finding “the best” is that this phrase can be quite slippery. Seriously. Different people think differently. What might be a good idea to you might be a horrible idea to another person. In other words, what might be “the best” for you might not be such an optimal option for another person. Different people look at the world differently. Different people have different preferences. We all have our own different definition of what constitutes “the best.” Unfortunately, this phrase is used most often by people that are trying to sell stuff. They always say they have the best goods and services. They always say they have the best resorts. They have the best airplanes, you name it. They keep hammering this phrase “the best” until it’s basically drained of all meaning. Americans tend to abuse the phrase “the best” as much as they abuse the word love. It has pretty much lost all its meaning. You have to keep this in mind when you’re looking for the best rice cookers. You have to remember that the best really is a subjective term. If you want to add some meat into what would otherwise be a squishy term as “the best,” you have to apply a different framework. Instead of focusing on how somebody else defines what is best for you, you should define this phrase in terms of what works for you. In other words, base it on your particular needs and circumstances. The good news is that you can easily arrive at the best rice cookers for your particular cooking needs and situation by answering the following questions. These questions are situational. These questions don’t apply a cookie-cutter approach. These questions don’t dictate a particular outcome. Instead, these questions go to the heart of your particular needs and your usage patterns. In short, they help you make an informed decision that makes sense in your particular context and circumstance. What will you be cooking most of the time? Obviously, most people are in the market for rice cookers because they want to cook rice. No big mystery there. However, most people are also looking to cook other things than just rice with their rice cooker. A lot of people use rice cookers for steaming. Other people use rice cookers for preparing certain types of eggs. There are many ways you can use a rice cooker. You have to be very clear as to what kind of food you will be preparing with your rice cooker most of the time. This can help steer you towards certain models of rice cookers and away from other types of models. Which brands/models have the right feature? Once you’ve figured out what your particular needs are, you can then start filtering out different brands and models of rice cookers based on your needs. This is fairly easy to do. You look at your list of requirements, and you look at the particular features of different brands and models. A pattern will quickly emerge. You will see which features directly address your needs and which features are indirectly related. Of course, you need to focus on the brands and models that directly address most, if not all, of your particular needs. However, there are certain needs that are nonnegotiable. It is nonnegotiable that a rice cooker must be able to steam rice properly. If a particular model does a lousy job of doing that, then you need to take it of your list. What other users say about your brand/model’s features? After you have used online price comparison engines to come up with brands and models that come with certain features and cross reference them their prices, your next step is to look at review sites. Review sites can come in many different forms. They can be mini-sites. These are small websites that have a small collection of reviews. They can be huge review sites focused on certain appliances and cookware. Alternatively, they can take the form of blogs. Regardless, you need to keep the particular features in mind when doing research on these smaller types of sites. You have to be clear as to the particular interaction of brand and model and feature that you are researching. Many users might have a lot of things to say regarding a particular brand and model, but the feature description might be off. Be always on the look out for fake reviews. Be on the look out for conflicts of interests as well as deceptive reviews posted by competitors. Despite all the particular pitfalls of these types of smaller sites, they do provide enough information that will help you identify the right rice cookers. By defining “the best” based on your particular needs and situation, you increase your chances of making the right decision. This methodology applies to anything you buy online not just rice cookers. By being strategic and methodical regarding your product research, you increase the chances of walking away with a decision that you could live with not just now but long into the future.